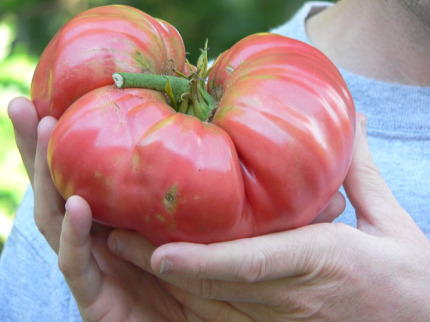 Admiring a tomato so fresh it’s still warm from the sun. Snipping chives for homemade salad dressing. Experiencing the magic of putting one potato in the ground in April and digging up eight in August. I created the Hudson Valley Backyard Farm Company to share my passion for gardening — to help others grow their own fresh, organic vegetables. 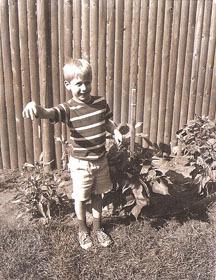 I’ve been gardening and cooking since I was six years old. My family grew tomatoes, sweet peppers and cucumbers every year, along with beans and some other veggies. I loved watching the veggies grow and hated the weeding (I still dislike weeding and set up my gardens to mostly avoid it). In college, I thought I wanted to be a molecular biologist, and then maybe a teacher. I worked in biology research labs and eventually got my teaching degree, but neither profession seemed right for me. After teaching I needed a big change (I still sometimes refer to myself as a recovering teacher). I began working for a landscaping company, the most progressive one I’ve ever encountered. Even back in the early `90’s, the owner offered organic lawn care. I started as the lowest guy on a crew, grew to crew leader, and eventually ran half the company. The experience inspired me to enter the Conway School of Landscape Design, where I earned a degree in Landscape Design. The school has a very strong environmental ethic and teaches sustainable landscape design through real world projects. The Conway school opened my eyes to environmentally friendly gardening and landscaping. I learned about invasive plant species (link to invasive species articles maybe wikipedia) and the importance of studying all of the natural (ie. slopes, soils, vegetation) and human influences (ie. how people use a site, legal restrictions) when designing a project. After Conway, I landed a job with the Scenic Hudson Land Trust (SHLT), which protects land along the Hudson River from New York City to Albany. I got to make parks! It’s here that I learned to work with local governments, design professionals, local interest groups and contractors of many types and sizes. Still, I wasn’t hitting my stride. During the same time I was at SHLT my wife, Karen, and I also bought our first house. This allowed my gardening to reach its full flowering (pardon the pun). Everywhere I’d lived as an adult, I’d found a way to garden. It might have been an upside-down wooden pallet filled with topsoil in an otherwise asphalted yard, but I found a way. In my own house I could do whatever I wanted gardening-wise, and I did. I was determined to grow my food organically, so I learned how to cut out the pesticides, herbicides and petroleum-based fertilizers. I practiced companion planting and grew only heirloom vegetable varieties. I grew a TON of vegetables — more vegetables than Karen and I could eat fresh (as much as 462 pounds of vegetables in a single season). That’s when I learned how to PRESERVE! 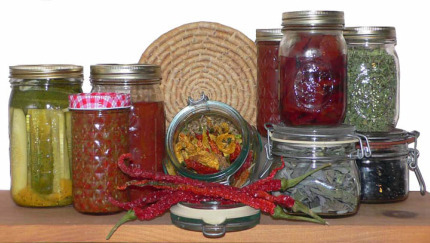 Karen had some canning equipment and jars from her mother, Dot. I got some books and learned how to use the equipment. I made salsa and tomato sauce, blackberry jam and wine, frozen green beans and pesto, dried herbs and more. We ate very well that year. In 2007 a friend sent me a link to the Seattle Urban Farm Company. The light bulb went off instantly — “This is what I should be doing!” Two years later, I launched Hudson Valley Backyard Farm Company. My mission is simple – to help you grow your own fresh, delicious vegetables. 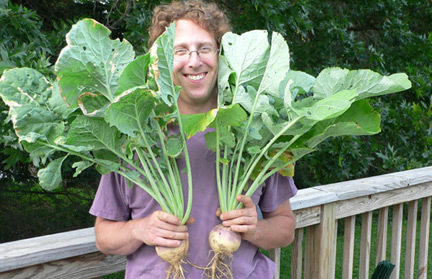 I’ll install and maintain an organic vegetable garden in your backyard or business (great for restaurants). I feel so lucky – I’ve finally found what I love to do! And my company is ready to grow, just like the veggies I’d like to plant in your yard. my husband asked me to look up your company and my interest is peaked. we’ve had 4 raised garden beds on our 1 acre property for about 10 years. at the time we used pressure treated lumber for the boxes…not knowing what else to use. about 5 years ago, i started buying organic seeds and plants for our garden as we had gradually switched over from conventional. i love my gardens and know that we need to change out those boxes…hopefully we haven’t done too much damage to our bodies because of this. i am interested in knowing more of what you could do to help us in our quest for a healthier garden adventure.